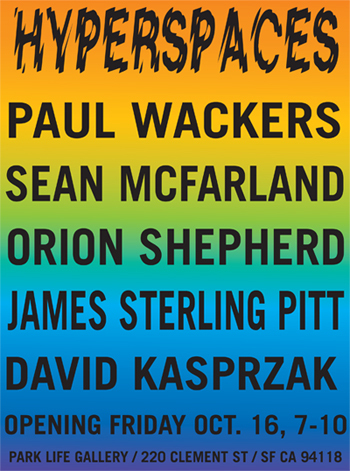 Park Life presents HYPERSPACES, a group exhibition of new works by Sean Mcfarland, Paul Wackers, David Kasprzak, Orion Shepherd, and James Sterling Pitt. 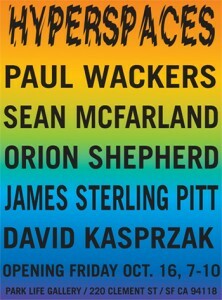 HYPERSPACES is a collection of new work from five artists attempting to live and work in an ever-changing environment and consciousness, a constant state of flux. This work illustrates and catalogues the theoretical and physical spaces that these artists and society, as a whole, manufactures to feel safe, comfortable, and productive. Whether it is a studio or an unexplainable corner of the mind, these spaces function as centers of refuge and creativity, and as laboratories for research into an existence that is potentially larger than three dimensions.